Yesterday we went to the AQS Museum, the Rotary to view antique quilts and shop a few vendors. Then we went to Eleanor Burns lecture and more shopping. We had lunch and dinner at two different churches. Lunch was served by the Mayor of Paducah. Today we're headed for the quilt show. Hope you're stitching today. Thanks to all of you who have entered my birthday giveaway. I've used a random number generator, and the winner is comment number 32: quilter74, Claudia. I've emailed Claudia so that she can send me her address. Thanks for all of your happy birthday wishes. I've enjoyed reading all of your comments and what you enjoy doing on your birthday. I leave for Paducah bright and early tomorrow and hope to report from there. The trip to the quilt show is my present from my husband!!! Hope you are all finding some time to do some stitching. Thanks for visiting. Happy Tuesday! Today is my birthday, and I thought I would share some of my goodies that I have bought and have a giveaway. I found not only one - but two copies of the book, Material Obsession. I love all of the ideas that are in this book including the Dresden Plate with the polka dot center that is on the cover so I'll share a copy. I also found some more Bliss and now have enough to make a project so I'll share a charm pack of that, too. To be entered in the giveaway, just leave a comment and tell me what you like to do on your birthday. If you are a no reply blogger, leave me an email address where I can reach you. I'll pick a number using a random generator (or my husband) probably sometime on Thursday. I'm heading for Paducah bright and early Friday morning (provided the River stays in her banks), and I hope to post from there. I appreciate all of my Followers both the new ones and those of you that have been following for awhile. Hope you have some time to stitch today. Thanks for visiting! Today I have a few nine patches on my design wall. They are made more or less from the same line of fabric and will finish at 6 inches. The reason I said "a few" is that there are 72 in the photo; I have 175 total. I plan to make a quilt for our king sized bed. I've had these nine patches in a baggie for a few years. I'm not sure why; I really like them. Maybe I just could never figure out quite how to set them. I found this photo in the latest issue of American Patchwork & Quilting. If I use this setting the quilt will be too large because the nine patches in the magazine are smaller. I kind of like this layout because there are places for your eye to rest. Here is an idea from the Connecting Threads website. I have a bit of yardage left from these fabrics plus a few pieces of some of the others from the line. There are lots of nine patch ideas to choose from. Any ideas or thoughts? Leave a comment. I hope you are finding some time to take a few stitches today. Thanks for visiting. I bought a few different reds to use in several different projects. I love all of these and think that most of them could work together in the same project. Here is the new Moda Collection for a Cause called Faith. This is mostly pinks and browns with a bit of red, but I think it is a really pretty collection. I also bought a jelly roll and a bit of yardage of this Moda line called Origins by Basic Grey. I love greens, and this has tans, greys, and different shades of green. I just love this one. It turns out that this lady knew the secret to the good tasting coffee. I'm a bit of a coffee snob, and I drink Starbucks whenever I get a chance. The secret ingredient of the coffee at Rise 'N Roll is a sprinkle of cinnamon on their coffee grounds before brewing. So I've been trying that, and it does give the coffee that extra something. So give it a try, and let me know what you think. The little coffee themed mug rug/small quilt was made for me by my friend, Val, from Canada. I really love it! I hope you are finding some time to do some stitching today. Thanks for stopping by for a visit, and Happy Easter! Today is One Flower Wednesday. Thanks to Karen at www.journeyofaquilter.blogspot.com for hosting this. I have fallen a bit behind the last couple of weeks, so I did 3 flowers this week. I love this center piece of fabric with the brown birds. I think I still have a bit of it left but not much. 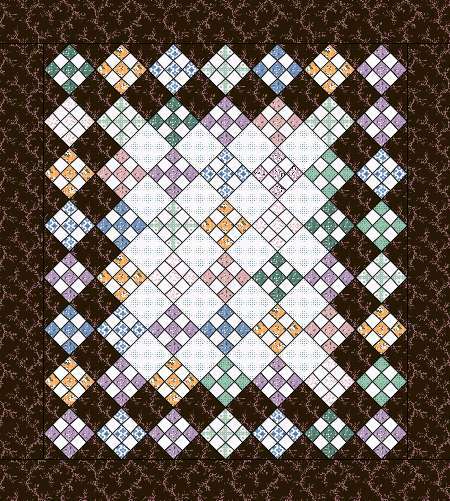 This is from the book, Small Blocks, Stunning Quilts, by Mary Elizabeth Kinch and Biz Storms, which is still one of my favorite books. This book was released in late 2008, and I still want to make every quilt in this book someday. 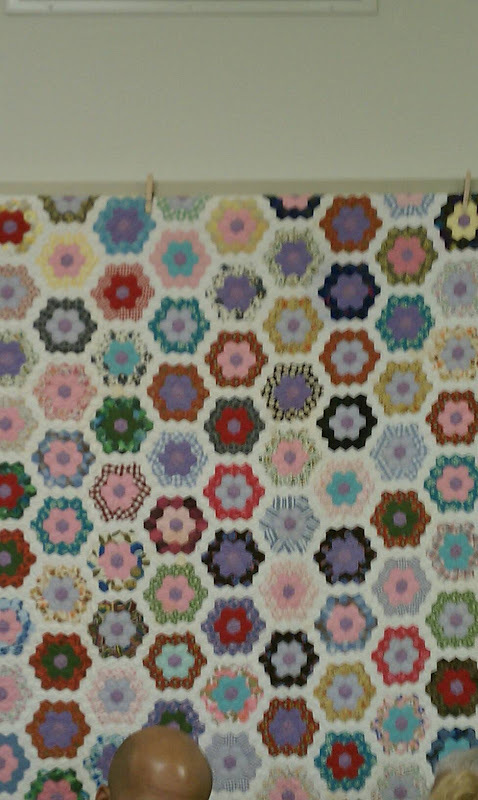 But then I saw this quilt in Quiltmania magazine, and I think maybe this is what I'll do with the hexagons I've been making. I love that applique' center surrounded by the hexagons. I have 14 hexagons....so I'll keep stitching. I hope you are all spending some time stitching on your favorite project. Thanks for stopping by for a visit. These are the things on my design wall this morning. The blue and cheddar blocks are the beginning of my version of an antique quilt that Rebecca showed last fall at our Dear Jane retreat in Shipshewana. 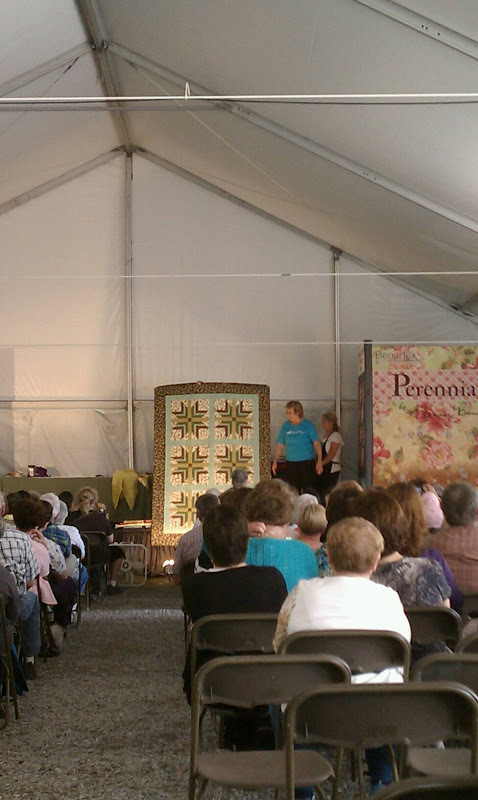 Rebecca is the owner of Rebecca's Arts and Antiques, and the quilt is in her personal collection. When I saw this quilt I knew I wanted to recreate it. 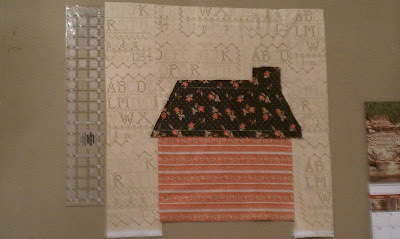 The other photo is the beginning of house number 1 from the Home Sweet Home book by Barb Adams and Alma Allen. I've seen this quilt on other blogs and love it. I bought most of the fabrics in Shipshewana, and I like them. I know the book said to cut the background roughly 16 x 20, but it just looks huge to me. So I think this block is going to stay on my design wall for awhile until I decide what to do about it. My laptop is on life support for the time being. I think I clicked yes in a dialog box where I really meant no. So I'm writing this post from my phone. This is a first for me, and I hope it comes through ok. Thanks to Judy L. at www.patchworktimes.com for hosting design wall Monday. I hope you are all busy stitching today. Thanks for stopping by for a visit. This is my finished Roll Roll Cotton Boll quilt top!!! This was a mystery from Bonnie Hunter that started a short while after our last retreat in November. I thought I would never finish when she posted the clue to do 600 half square triangles, but here it is. This quilt belongs to Deb at Disaster Diva blog. I love the lime! 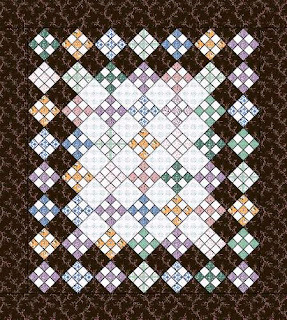 This quilt by Cathy is based on a quilt by Edyta Sitar. I love the border fabric, and look at all of the half square triangles. This quilt is by Barb from Minnesota. Beautiful applique' and I love the cats!! This one was striking. 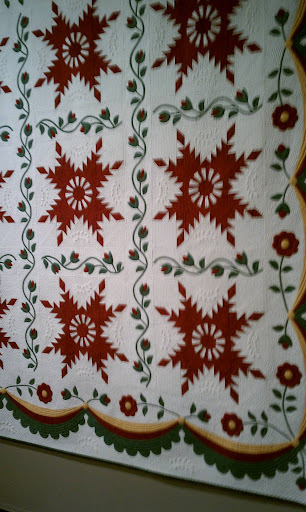 I don't know the name of the maker or the quilt pattern. A beautiful version of the Sarah Johnson quilt. Here are two different versions of Aunt Millie's Garden - one is by Lynn and the other by Elaine. I love these quilts. These girls are part of a group where several members are making their own version of the quilt. The rest of show and tell is on my webshots page. I hope you are finding some time to do some stitching today. Thanks for stopping by for a visit. This is Rebecca from Rebecca's Arts and Antiques in Shipshewana, Indiana, and notice what she is holding. While we were sewing at the Farmstead Inn, she came in with a package to show us. She had just received the tote bag from her friend Joe who had been to the Infinite Variety Red and White quilt exhibit in New York. Many of us that come regularly to the Dear Jane retreats have met Joe who is a quilt dealer from Ohio. Apparently at one time Joe owned the red and white Vortex quilt that was displayed at the show and is on the tote bag. He sold it to a dealer in New York who in turn sold it to Joanna Rose. Seeing Rebecca standing there with the tote bag really makes you think about the six degrees of separation theory. And another strange turn regarding this quilt. Last fall at the Dear Jane retreat I took this photo of a quilt recreated by my friend, Claire. It is on display in an exhibit at the Elkhart County Historical Museum along with other quilts created by the Maple Leaf Quilt Guild as part of their latest temporary exhibit. Claire made this quilt before anyone had even heard of the Infinite Variety Quilt Exhibit. I hope you are finding some time to stitch today. Thanks for visiting. On Day 4 of my Shipshewana retreat, I visited Rebecca's Arts and Antiques. 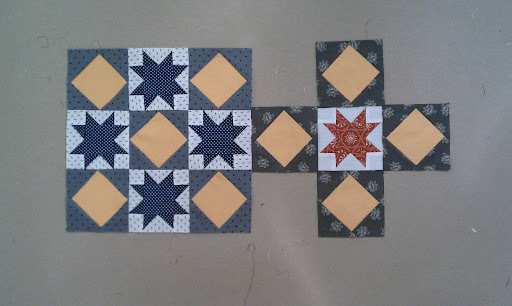 Today on my design wall I have the antique nine patch blocks that I bought there along with the bigger T block. I believe Rebecca said that the nine patches were from Ohio circa 1930. For some reason I only bought 19 blocks, and I could use 25 for the arrangement below. So I'll either have to come up with a different arrangement or call Rebecca and have her save me 5 more of the blocks. The two color applique' is called Sunflowers and is from Pacific Rim Quilt Company. I finished the hand applique' on it during the retreat. Here is Rebecca's Arts and Antiques. 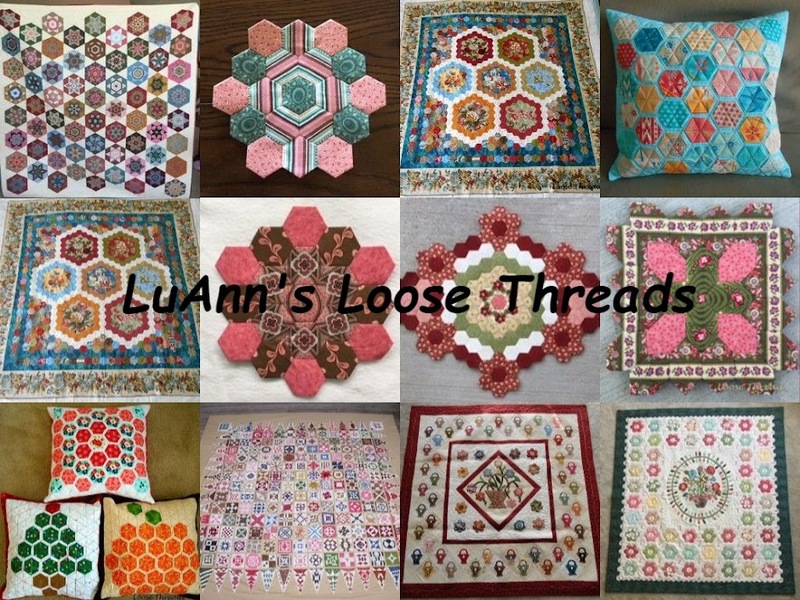 She has lots of vintage items in her shop for sale including antique quilts, quilt tops, and blocks. If you get to Shipshewana, Rebeccas is a must see. The shop has wooden floors, and when you take that first step inside it will bring back memories of when you were younger. Here are just a few of the things inside of Rebeccas. There are lots of beautiful quilts for sale. The stack of quilts at the far left corner of the photo are quilt tops for sale. Baskets, wooden spoons, dishcloths, wooden clothes dryers, baskets and more. Interesting pattern in these blocks. One friend purchased this quilt. Another friend purchased both of these. Another friend purchased this top and some backing to finish the quilt. Thanks to Judy L. for hosting Design Wall Monday. Welcome to my new followers and thanks to everyone for visiting. Somehow day 2 and day 3 of our retreat have melded together and just slipped away. It could be all of that talking and eating. I'm sure the lack of sleep has quite a bit to do with that, too. Thursday started with a trip outside of Shipshewana into Amish country. First stop was the Red Skillet over at Rome City. I don't have a photo so imagine a red building that looks like a red metal farm building that sits back off of the road. I had bacon, eggs and toast here for breakfast. The idea was to have a good breakfast so that I would make good shopping decisions. First stop was Caroline's Cottage Cottons in Rome City, Indiana. Caroline's is a small quilt shop in a house a block off of the main highway. I bought a little bit of fabric there. I had a list of fabrics I wanted to buy for projects that I have in mind. This is a fat quarter pack of blue and cheddar reproduction fabrics. This was the first thing I bought that wasn't on my list. But it was a nice pack and it was wrapped up with a frilly bow. I know I'll find a use for it. Then I found this piece of Jo Morton border print. This was the second thing that wasn't on my list, but I love gold and rust so I know this one will find its way into a project one day. These pieces of fabric said, "Pick me up and buy me." They weren't on the list either, but I just love them. At this point I just stopped looking at that list and shopped on pure instinct. Next it was on to Knitting Today at Wolcotville. The yarn here is just beautiful. There is a lot packed into the shop, and everyone there is so helpful. I bought a bag full of yarn which wasn't on my list either, but at least I know this yarn is for a blanket that looks like a nine patch quilt. After all of that shopping it was time for a latte' at The Kitchen Cupboard in the Davis Mercantile building. A pretzel at Jo-Jos is good anytime of the day....even for breakfast. At this point in the retreat there is more shopping and eating than there is sewing...but we're having a great time. There will be plenty of time for sewing after we get finished with all of this shopping. I hope you are all stitching today. Thanks for visiting.